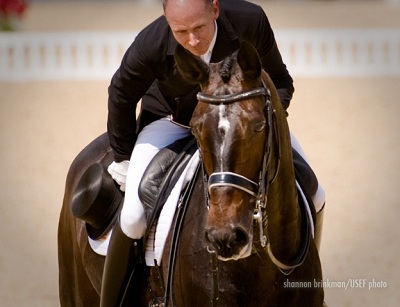 Steffen Peters returned to the Olympic Games with Ravel – proving that the 14-year-old KWPN gelding still has what it takes to be competitive at the highest level of the sport of dressage. 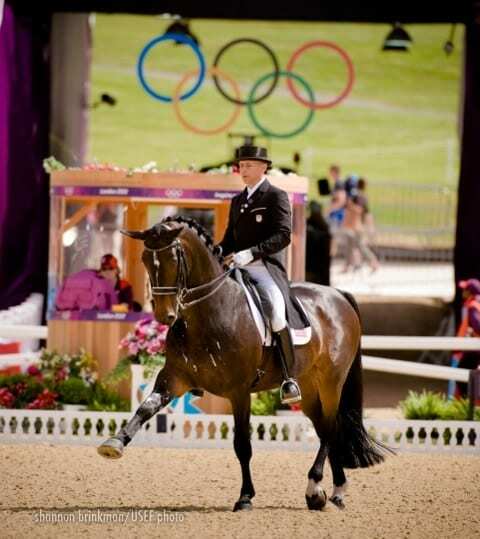 Four years after they were fourth Individually in Hong Kong at the 2008 Games, Peters and Ravel scored 77.70 in Greenwich Park’s main arena to lead the U.S. Team to fifth place at the conclusion of the first half of the Team Competition. Charlotte Dujardin and Valegro set the mark and lead the British effort as they look to win their first Team Gold in dressage. Their score of 83.66 was never in danger of being touched. Adelinde Cornelissen and Parzival are second for The Netherlands on 81.68 and Helen Langehanenberg and Damon Hill are third for Germany. The British lead by a narrow margin over the Germans in the Team score, as the top seven teams head into August 7th’s Grand Prix Special. Peters and Four Winds Farms’ Ravel put in a serious test, their trot half-pass, pirouettes and canter serpentine were phenomenal and Peters earned excellent marks for his riding. They are seasoned veterans at this point together and the strength of their partnership was evident. Before Peters’ test, Tina Konyot got the day started with a solid effort on her own and John Byrialsen’s 14-year-old Danish Warmblood stallion Calecto V. The seasoned pair scored 70.45. A few small mistakes kept them out of the highest placings. 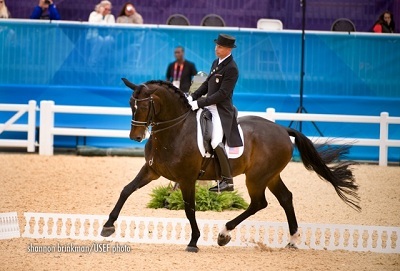 Jan Ebeling got the American effort started on Thursday with Rafalca – their score of 70.243 % means the U.S. Team has an average score of 72.801% heading into the Grand Prix. Adrienne Lyle did her part for the US effort riding as an Individual. 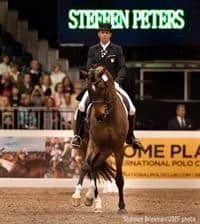 She rode confidently on Peggy Thomas’ 13-year-old Oldenburg gelding Wizard in her first Olympic Games and the extravagant horse managed to maintain his enthusiasm for most of their test. A few mistakes kept them from breaking 70, but their partnership promises volumes for the future. Lyle sits in 35th place on a score of 69.46.